HerCut is a new innovation in "cut care" rather than hair care. The whole line been formulated to target specific hair cuts as opposed to hair types. 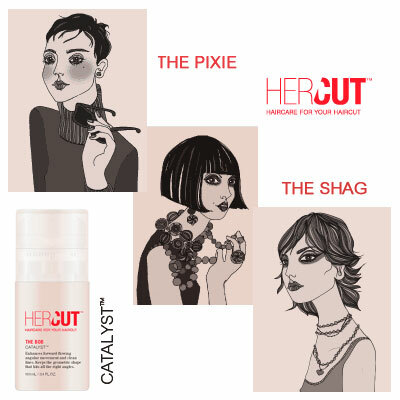 Now with HerCut you can love those cute manes in pixie, bob, shag or layers whether sleek and smooth or packed with texture by shifting the focus from styling goals to haircut enhancing. Each hair cut has its own Cut Care Cocktail, or catalyst, as the company calls it, developed and formulated using different levels of enhancement effects depending on the cut. If you have a blunt hair cut, then you need straight lines that align correctly. The Blunt’s catalyst utilizes strand compression to diminish space between fibers to deliver uniformity and re-create the out of salon look. If you have a shaggy hair cut, the catalyst in The Shag with polymers will add texture, dimension and provide lift at the root to yield layers that move. For longer hairstyles with Layers’ catalyst uses a cationic complex to connect and control layers. The purpose of HerCut is to make a haircut work and it will redefines hair care as we know it today.